In cases where complex mixtures have been analyzed with a chromatographic technique it is most likely that you encounter numerous overlapping peaks in your chromatograms. If you are only interested in a few, well separated compounds you are very lucky. But if you are seeking to elucidate most or all of the compounds in your samples you have to apply some kind of deconvolution on your data. In case of nominal mass GC/MS the free software AMDIS is the most widely used deconvolution tool, not only because it has been available for a long time, but also because it can read many different vendor formats and works well together with the library search software NIST MS Search. OpenChrom has an AMDIS connector implemented, which allows to utilze the deconvolution algorithm of AMDIS for single measurements and for batch-processing of multiple files. Linux users: It’s possible to install AMDIS under Linux using WineHQ. 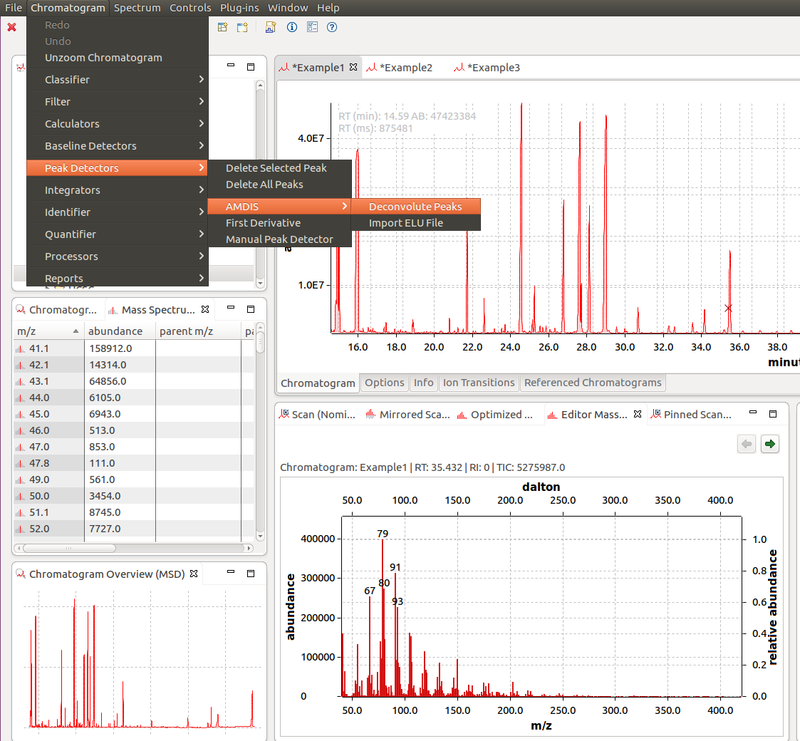 In order to use the AMDIS deconvolution from within OpenChrom the path to the executable AMDIS32$.exe and to a folder for temporary results has to be set in the according “Preferences” dialog (Menu > Window > Preferences >Chromatography/Spectrometry > Peak Detector > AMDIS Peak Detector). 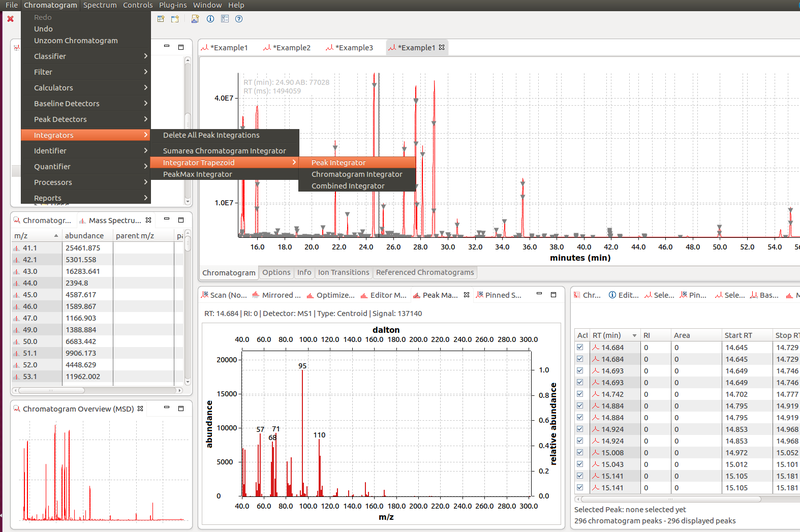 The preferences dialog within OpenChrom allows to set further parameters for the deconvolution process, most of which should be familiar to the proficient AMDIS users, as they can also be set directly in AMDIS. 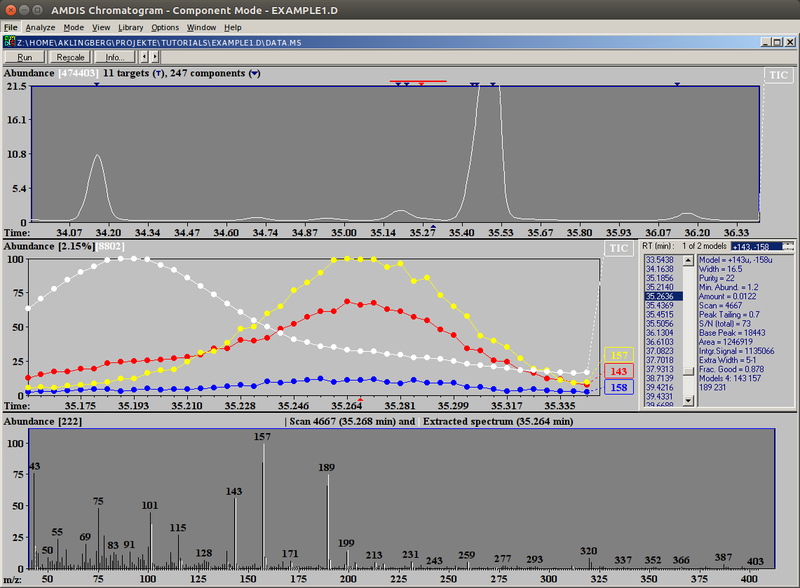 Note, that the parameter set in OpenChrom will override the parameters set directly in AMDIS. The parameters not adjustable in OpenChrom will be fetched from the settings within AMDIS (e.g. the very handy “filter” settings). For those not proficient with AMDIS yet, it is strongly recommended to consult the AMDIS documentation to learn about the various parameters influencing the deconvolution performance. Via the menu now the deconvolution can be triggered. The AMDIS UI pops up with a progress bar indicating a successful connection to AMDIS. Note, that only the peak detection and deconvolution results are imported into OpenChrom, but not the peak integration nor the identification results. Subsequently the peak integration can be done with the OpenChrom peak integrator. And also an identification against the NIST (see according blog post) via the NIST-DB connector or a personalized *.msl (AMDIS format), *.msp (NIST export format) or *.spc (Shimadzu format) library via the “File Identifier” can be done directly from within OpenChrom. Check here how to edit personalized libraries.